My weekend kind of started out a bit early, with my company’s annual ski trip to Winter Park. However, this year’s trip was a bit out of the norm. We loaded up the bus at Dinosaur Lots as usual, but our bus driver seemed a little odd. I didn’t pay too much attention – I was just excited as it was snowing hard in the mountains, and we were about to have a great day! Unfortunately, that feeling about the bus driver turned out to be prophetic. As we were heading up the pass to Winter Park, our bus started sliding a bit here and there, and we could visibly see the driver getting nervous. Fortunately, we made it to the top of the pass without incident – and a slew of snowplows pulled out in front of us, which we figured would make the rest of the drive much easier. Unfortunately, our bus driver had a complete panic attack, turned the bus around (on a very narrow spot on the pass), and insisted on going home rather than continuing or even pulling over to wait out the snow. While we understood concerns about the weather, we were already well past the dangerous part of the drive, and the speed with which he went careening back down the pass (despite us begging him to pull over or at least slow down) made it clear that there was something more to this than just the weather. Even when we got back to I-70, where the roads were dry, he was swerving back and forth across multiple lanes and speeding like crazy… so while we weren’t happy that our ski day was canceled, we were very grateful to make it off the bus without a crash! After getting back to the lot, we all went different ways – some people called it a day entirely and headed home to catch up on work, a few people drove to Winter Park on their own, and a few of us decided to head to Breckenridge instead. Since I was headed out to Vail for the weekend, it made sense for me to start making my way out that way! My colleagues Branton and Mike and I had fun getting in a few runs in at Breck (we didn’t get there till 1pm, so there wasn’t a ton of time), but unfortunately, I found that my legs were already pretty sore. I’ve been working on a project in New York lately, and my hotel there has Peloton bikes in the gym, so I’ve been enjoying getting back into spinning there. 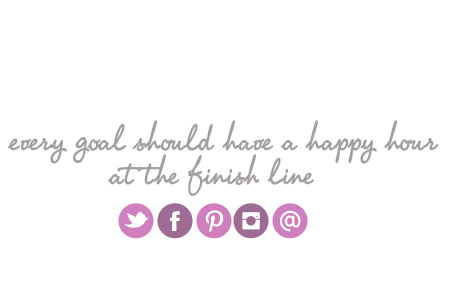 (If you use Peloton and want to friend me, my username is 50by25.) However, I hadn’t realized that biking uses similar leg muscles to skiing… until I got on the mountain and my quads were already screaming on my first run. Oops! I was kind of glad I wasn’t trying to get a full day of skiing in, and also glad when Mike suggested we not even try to ski all the way to last chair. I finally headed to Vail around 6pm – a little later than I planned, but grateful for the catch up. While I always go out to the mountains on Friday nights thinking I’ll venture out to one of the local bars/restaurants and meet some new friends in town, this week was no exception in that I instead chose to cook a quick dinner at home, catch up on some emails and reading, and go to bed early. My pasta was delicious though! I’m trying to cut back on my spending lately, but have a rule that if I was planning to go out to dinner and instead hit the grocery store, it’s fine to treat myself to pre-made things that are normally pricier than cooking from scratch. 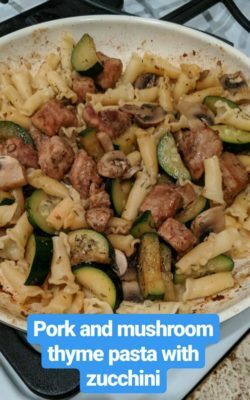 I found a package of pork tenderloin in a thyme-mushroom wine sauce and it was perfect over some basic pasta! 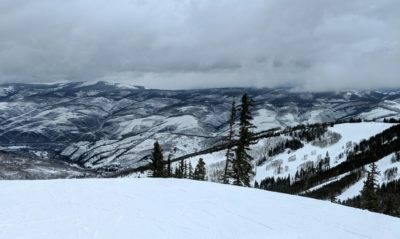 While I normally try to get out to the mountain close to first chair (8:30am), Saturday I had a leisurely morning catching up on some work emails over coffee, then heading to Beaver Creek around 10am. I had so much fun doing the Talons Challenge the week before, I thought I would do it again on my own. However, with my late start and the realization that my legs were already really sore (darn – the extra night’s sleep didn’t help), I decided I’d cut it down to a half-Talons-Challenge, and pushed myself to do all seven runs on Grouse Mountain. That included several very steep double black mogul runs that had worried me last week, so I was thrilled to head down them easily this week – turns out that Falcon Park is indeed lovely when it’s not crowded! I really liked having a goal to work toward while skiing, and look forward to doing this more in the future. The views from the top of Grouse are always so pretty, even when it’s stormy! We were getting a massive snowstorm on Sunday, so with my legs already totally spent, I decided instead of staying in the mountains the rest of the weekend, I’d head home and try to beat the storm. On the way, I reached out to a few friends to make plans in town, and soon had a full weekend planned! Dress shopping with my friends Chris and Kate Saturday, a Bodypump class with my friend Heather Sunday morning, and brunch with my friend Lauren after that. 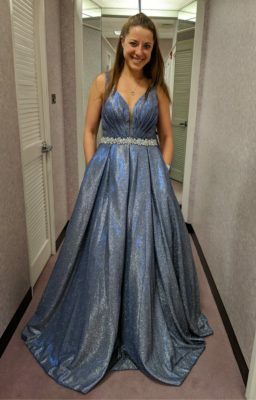 Chris already had her dress (though we made her try on a few more just for fun), and by the end of our shopping expedition, Kate too had picked out a slinky red sequined number that we agreed made her look like Jessica Rabbit (in a fabulous way). I was still undecided, though there were several options I liked. But with no rush to decide, since the event is in April, we called it a day, and headed over to Bad Daddy Burger Bar on the other side of the mall, where Chris and Kate’s husbands had brought all the kids for dinner. The snowflakes were swirling like crazy, so I was glad we were able to get a bite so close to home and then call it an early night! Sunday morning was pretty snowy first thing in the morning, and it took me longer than usual to get to the gym. Since Bodypump is one of the most popular classes, I was worried I wouldn’t get a spot, but I lucked out – Chuze was pretty quiet, since a lot of people had stayed off the roads. There was a sub teaching the class, who I didn’t like quite as much as the regular teacher, but I was still really glad I had gone. 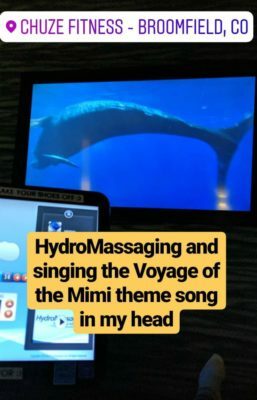 Plus, going to Chuze meant I got to hit the hydromassage!! Plus, Heather and I got to catch up over coffee after! I like starting Sunday with both the gym and seeing friends :) And I got to do more of that after coffee – I headed from there up to Lafayette for brunch with my friend Lauren. Maybe it’s weird to go from coffee straight to brunch, but I was just grateful I was able to make all the puzzle pieces of the plans fit together so nicely.